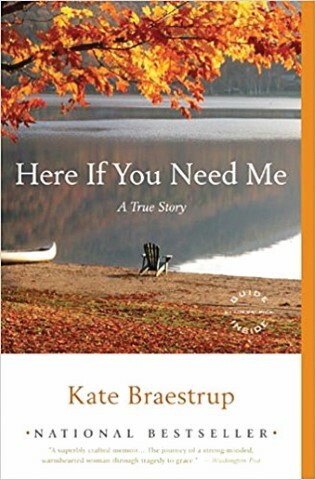 Kate Braestrup’s memoir, “Here if You Need Me”, is beautiful and tender, funny and sad, sweet but not cloying. Kate’s husband was a Maine State Trooper who was killed in a car accident when their youngest child was just 10. Widowed with four children, Braestrup decides to carry on with her husband’s dream of becoming a Unitarian minister. Once ordained, she begins working as the Chaplain of the Maine Warden Service, something she knows almost nothing about until she becomes their Reverend. The book opens with the story of a six-year-old girl lost in the woods. The reader stands with Braestrup as she stands with the terrified parents, waiting, cold and afraid. 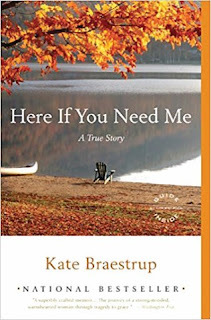 When the parents tell her they don’t believe in God, Kate reassures them that she’s merely there to wait with them. There’s something tremendously tender in that waiting. The rest of the book unfurls like a sheaf of papers, one story after the other, loosely connected, not in any strict order. And yet, because of Braestrup’s easy and confident tone, I felt secure in the journey on which she was leading me. This is not merely a sad story. At times, Braestrup is hilariously self-deprecating. She’s funny and sweet about her kids. She has excellent timing with jokes, anecdotes, and quips surrounding her beloved game wardens. But, she’s also generous with her life observations, her biblical interpretations, and her patient belief in the human spirit. This is a story about faith - what it means to have faith and be faithful. Braestrup’s version of religion lies more in the goodness of people than in any divine being (although she clearly acknowledges and believes in a higher being). This is a story about grief, and the capacity for the human heart to go on. It’s an acknowledgement of the frailty of life, and the risk we take by engaging in it. Braestrup writes with such humanity that readers will be hard-pressed to leave this book without feeling something like hope.